In 2013, I accepted an invitation to join the experienced mountaineer Satyabrata Dam on a Mt. Everest Expedition. Such an opportunity required serious consideration, training, investment and drive. As I start to feel, imagine and plan a journey from the ocean floor to the top of the world, I am reminded on the artist photographer who joined Hillary and Tenzing. A man by the name of Alfred Gregory whom I had the honour of meeting in Australia. A man with eyes so reflective, it was as if he reflected light from the mountain peak itself. I cannot explain where I am in all of this. It doesn't make sense in my mind, only my heart. I was always meant to climb. "2013 is the 60th Anniversary of the first successful summit of Mt Everest by Hillary & Tenzing. That moment was captured on film by one of those men [Hillary]. But the expedition's four month long trek to the top was documented by a fellow climber, Englishman Alfred Gregory. His iconic images were syndicated around the world, feeding the public's fascination with the assault on Everest." To mark the 50th Anniversary of this expedition, Gregory’s wife Sue asked me to help her arrange for the restoration of a valuable timepiece that accompanied him on that Everest trip. Rolex SA was honored to assist us and refurbished the original official British Expedition team watch c.1952. Sue surprised Alfred by re-presenting it again at an Australian-Himalayan Foundation celebration! Mr. & Mrs. Gregory travelled to Melbourne to thank me personally and share a signed copy of Alfred Gregory’s Everest (published for the 40th anniversary of the first ascent). I remember the meeting vividly. Despite numerous phone calls and hand written letters from Sue, the gravity of the occasion took me by surprise. The room was filled with Alf’s gentle yet powerful aura: that of timeless tranquility and knowing. Blurring inadequate words of thanks, I shook Alfred’s hand and peered into his clear, watery snow-blinding eyes. Naively I was unprepared for feeling indebted, humbled and almost undeserving for all his remarkable gifts to the world. He had seen the top of the world and not just as a reporter, as a tough mountaineer and respectful poet of life. Alfred (Alf) Gregory passed away at his Australian home in 2010 just 3 days shy of his 97th birthday. It is in his honor Sue that I dedicate my participation in this expedition - striving to dignify the role of amateur artist explorer from sea to summit and beyond in search of ways to reveal that precious silence and poet spirit again in today’s highly-polluted world. 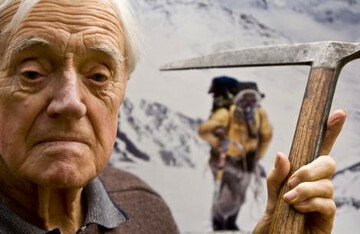 Photographer Alfred Gregory with the ice axe he used while on the famous Everest ascent. 1953 I photographed the silence on Everest.